The seller of today’s Nice Price or Crack Pipe droptop 280ZX says it’s on the market because he needs money for college. Let’s see if his pricing acumen means that he’ll ace that Economics class. Back in the ‘80s Toyota U.S.A. employed the tagline “Oh What a Feeling” in their ads, typically paired with images of Toyota owners jumping in the air as though for joy or as if they had just seen a snake. That ad campaign was long gone by the time yesterday’s 1996 Toyota Camry LE wagon rolled off its Georgetown, KY assembly line, but that didn’t stop the majority of you from feeling some “Oh” both for the car and for its modest $750 asking price. It looked as comfortable as an old pair of jeans, and despite some minor mechanical woes, lseemed ready for many more odometer barrel rolls. Speaking of which, how exactly do you roll? If you replied “why in a custom ‘80s Datsun droptop, of course” then we have much to discuss. Here we have just such a car. This 1982 Datsun 280ZX convertible looks to be both a reasonably well done chop job, as well as a remarkably clean and tidy underneath all the post-factory decollation. Now, before you get all in a huff about so irrevocably modifying a classic Z understand that this is not the first-generation S30 with its dedicated sports-oriented suspension and committed weight discipline. No, this is the next generation S130—a series 2 in fact—that was intended as far more of a grand tourer than a carver of canyons. The S130 eschewed the earlier cars’ taut Chapman strut rear suspension for a semi-trailing arm set up that was taken from the lugubrious 910 sedan. The weight blossomed from the S30's 2,300 pounds to a portly 2,850 for the S130 two seater. The 2+2 tipped the scales at around 150 more. None of that made the carry-over 145 horsepower, 2.8-litre L28 feel any more lithe, but a turbo model would eventually come along to help to address the performance issues. This convertible lacks the turbo motor, but it does sport that model’s hood with its single offset NACA inlet. It also has a lovely set of Turbo alloys— polished as all get out—and Orange Mist Metallic paint that seems to be in excellent shape. In fact, the whole car looks to be in really nice condition. The seller gives no information on who did the convertible conversion, but the bodywork, trunk finish, and the top all appear to have been professionally done. The car is advertised on Craigslist—bastion of all things quality—but it also turns up in a number of other places online too. From those I was able to ascertain that the seller is apparently the second owner, and that the car has benefitted from a new set of injectors, an Ansa exhaust, and those killer BFG tires just within the last 12 months. There are also a couple of videos of the car on YouTube but I’ll spare you those as they were shot portrait style and that’s way too irritating. Other aspects of the car that are of import? There’s 33,000 miles on the clock and the interior comes with both one of those talking dashboards—a door is ajar—and a factory head unit with a mechanical counter for the cassette tape. How retro is that?! There’s a five-speed stick behind the straight six, and the seller claims to have put the strut brace in to improve the handling. I imagine that it’s still all kinds of wonky, but then that’s the tradeoff for looking so hip. A tonneau covers the top when it’s down, while a plastic rear window affords visibility when it’s erect. The car comes with a clean New Jersey title and the promise of pretty much everything working as it should. The seller claims that he needs money for college and that’s why the ZX is for sale. He’s asking $14,000 which should get him a couple of years at community college, or perhaps buy his books at any of our nation’s fine private institutions of higher learning. Either way, we need to decide if the car is worth that. What’s your take on this custom ZX and that $14,000 asking? Does that seem like a deal to drop your classic top? Or, is that just too much for this ZX to bear? North New Jersey Craigslist, or go here if the ad disappears. 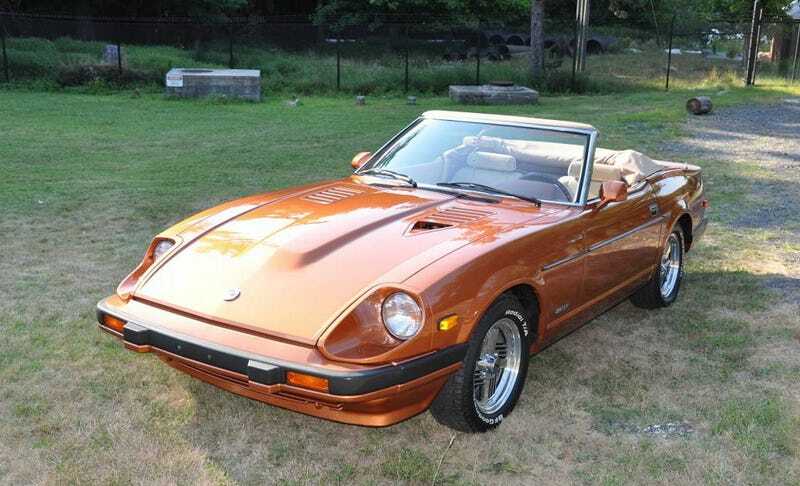 For $2,300, Is This 1977 Datsun F-10 An Effing Ten?